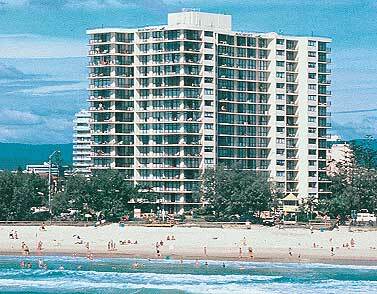 Cnr Staghorn Ave & The Esplanade, Surfers Paradise, Queensland, 4217 Australia. 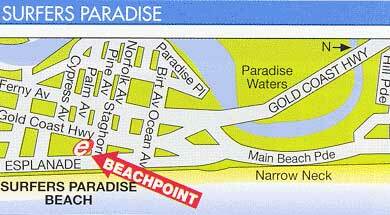 Beachpoint offers the ultimate holiday lifestyle. Just 50 metres from Surfers Paradise Beach and an easy five-minute walk to Cavill Avenue, Beachpoint offers affordable holiday accommodation on the Gold Coast. From its prime waterfront location, the resort offers spacious one and two bedroom apartments set amongst lush tropical gardens overlooking the beach. Beachpoint features large balconies to take in the generous views of Surfers Paradise, Pacific Ocean or surrounding Hinterland mountains. For motoring enthusiasts, some apartments also offer great viewing for the Gold Coast Indy. 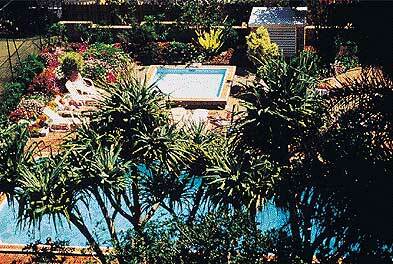 The resort’s apartments are self-contained including fully-equipped kitchens, laundry facilities and cable TV. Spend the day unwinding beside the indoor or outdoor pool, hitting a ball around the full-sized tennis court or indulging in an in room massage. Beachpoint’s leisure amenities include an indoor and outdoor swimming pool, children’s wading pool, spa, sauna, tennis courts and entertainment areas with BBQ cooking facilities. In-room massage treatments are also available. Featuring one and two bedroom spacious apartments, most with views over the beach, or the spectacular lights of Surfers Paradise. With the Hinterland providing a green backdrop of beauty, the rooms provide the perfect home away from home with full kitchen and laundry facilities. Available with queen + 2 single beds.